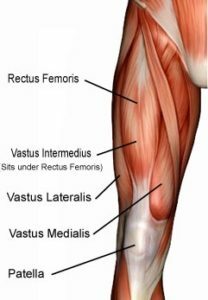 Quadriceps Femoris is Latin for “four-headed muscle of the Femor”; often shortened to Quads, it refers to a group of four muscles that make up the front and side of the thigh: the rectus femoris, vastus lateralis, vastus intermedius, and vastus medialis. The quads are used for knee extension or straightening of the knee (think kicking a football). These long muscles span from pelvis to tibia and the tendon crosses over the knee joint; because of this, injury or tension in the Quads can manifest as knee pain. Runners & cyclists alike can experience knee pain from tight Quads. Relaxing the tendons in both the hip & knee as well as releasing tension in the bulk of the muscles may give some relief. Self-care for this kind of tension might include stretching before and after a workout and possibly additional stretching during the day. Check out my YouTube video for an example of a stretch you can try at home. During a therapeutic session, stretching, rocking, and kneading are some techniques that may be used to give relief to quad tension. Always listen to your body. If you have sharp or chronic pain you may want to consult your doctor.